"I hope my bequest will help RIT Motorsports support more students on their teams. Teams are a great opportunity to build their skills, and hopefully find the beginning of a path to their own life passion." Tom Ash learned that some of the best lessons about working and business…and life…are found in student clubs and activities. And those clubs often help them find their life passions, too. Like many RIT alumni, Tom values his cooperative education for building skills that launched his successful career as an engineer and technical writer. But Tom found his passion outside of work - a passion for motorsports - and realized that his experience provided many of the same things his co-op did. After graduation, Tom raced motorcycles for about ten years, then switched passions to race in triathlons. 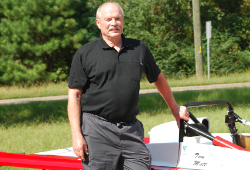 In his early 50s, he returned to motorsports and got involved in auto racing. As an engineer, it didn't take long for him to realize he enjoyed working on the cars more than driving them. Being part of a team, working together, moving a project forward, and problem-solving to help the team win was challenging and very interesting to him. Tom learned about RIT's racing teams on the circuit. RIT had made a name for itself among people in racing, and he started to follow the teams. He learned how students from all RIT's colleges participate and he could see how being on the race teams provided much of the same experience that he'd gotten as a co-op student. Motorsports is expensive. "There's a saying that if you want to make a million dollars racing, you need to start with five million!" Tom explains. His career gave him the financial resources to enjoy his passion for racing, but he knows that the cost keeps many others from getting involved - and for college teams, it's especially difficult. To help introduce RIT students to motorsports, and also show how they can build important career-focused skills as a member of the team, Tom made a bequest to fund RIT Motorsports. A charitable bequest is one of the easiest and most flexible ways that you can leave a gift to RIT that will make a lasting impact.